The vote is over, and this week Brett Kavanaugh heard his first round of cases as an Associate Justice of the United States Supreme Court. Predictably, there were protesters outside our nation’s top court following a trend of resistance that started well before Brett Kavanaugh’s confirmation process even began. 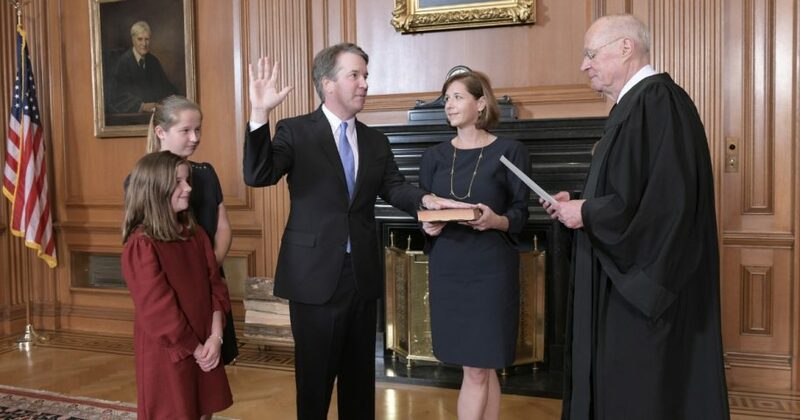 Justice Kavanaugh takes his seat following an ugly confirmation process that included protests, grandstanding, the revelation of accusations at the 11th hour, and finally, a seventh FBI investigation. While it’s anyone’s guess as to how long the protests outside the Supreme Court will last, what is certain is that the impact of the recent confirmation process will span far beyond just the makeup of the Supreme Court. Looking back, the 2016 election galvanized political activism from many groups – including and especially women. So much so that the day after the inauguration, the Women’s March took place in Washington, D.C. and in cities across the country. Women have always been politically active, but the Women’s March – with Linda Sarsour at the forefront – was the beginning of a movement aimed at undermining the Republican Congress and Donald Trump’s presidency. Shortly after the Women’s March we saw the popular rise of #MeToo. Both of these social movements have been strong advocates for women. They’re also major players in the so-called #Resistance; a unifying call for big-government liberals and socialists to obstruct anything put forward by President Trump. They wish to frame a national debate, inspired by identity politics, that influences other Americans to believe the President and other conservatives don’t care about women. The irony is that many of the most high-profile men exposed through the #MeToo movement have been Democrats: Harvey Weinstein, a gigantic Democratic fundraiser; Charlie Rose; Matt Laurer; Les Moonves; Anthony Weiner; Al Franken; Keith Ellison (who has still yet to suffer any political consequences for allegedly beating his ex-girlfriend); etc. Dating back further, there’s Bill Clinton and Ted Kennedy. Even Democratic Senator Corey Booker – who was an aggressor in the Kavanaugh hearings – has admitted to personally groping a woman inappropriately. Despite this, we see those on the left who cling to these movements for women continually attack the GOP for its supposed mistreatment of women. On the surface, this doesn’t seem to make sense. These movements should be apolitical. By specifically targeting Republicans they disservice many of the very legitimate parts of their cause. On the other hand, Democrats in power often decide to advocate against sexual assault when they can weaponize the crime and use it for political gain. The most recent example of this is Brett Kavanaugh. His confirmation seemed all but inevitable, and Democrats had nothing left to throw at him. Enter sexual assault charges in an attempt to bring him down. It didn’t matter that the accusation came from an event that reportedly took place 36 years ago or that there was no evidence or corroboration. The accusation itself was supposed to be enough. In this era, it is too emotional and too good politically to pass up. Plus, the media would assuredly be in lockstep with the Democrats. Then, one accusation was followed by another, and then another, with each one becoming more salacious and more deprived of evidence and corroboration. Do you think Justice Kavanaugh is a good fit for the Supreme Court? What Democrats weren’t counting on was for Brett Kavanaugh to punch back — and to punch back hard. They weren’t counting on him fighting for his integrity and more importantly, the truth. In Brett Kavanaugh, the #Resistance finally met its match. He stood up to the dishonesty of Senate Democrats and called them out for their politics of personal destruction. He was not going to let a good cause like #MeToo become #MeTooMcCarthyism. In Brett Kavanaugh, the #CounterResistance was born. We must embrace #MeToo when it seeks truth and justice. But if it becomes perceived as a political weapon used to destroy the lives of others over policy disagreements, it will have the potential to backfire. And the ones who will suffer the most will be the legitimate victims of sexual predation who end up being questioned for their motives. We saw this with Brett Kavanaugh, where people in America were questioning the credibility of his accuser. What was on full display from most Senate Democrats and members of the media was not the appearance of genuine concern for Dr. Ford. They were not seeking justice. They just wanted to stop a Supreme Court pick by any means necessary, even if it meant destroying the life of a man based on a decades old, uncorroborated and refuted accusation. With Brett Kavanaugh, we saw someone who felt he and his family had been victimized by accusations against him and who stood up and said: I am innocent and enough is enough. “You will never get me to quit,” he said. Now, we see the Democrats’ strategy may have backfired. Moving forward, Kavanugh will be seen as a conservative martyr who was deemed guilty based on a mere allegation, despite a complete lack of supporting facts. We are already seeing the impact of Democrats’ behavior during the confirmation process. A CNN/SRRS poll indicates only 36 percent of independent voters approve of how Democrats handled the process, compared with 58 percent who opposed their handling of the confirmation process. Further, recent polling also indicates increases for Republicans in key Senate races following the Kavanaugh confirmation. Prior to a few weeks ago, Brett Kavanaugh had a reputation that was beyond reproach. People saw a man who was under attack from Democrats in the politics of personal destruction as a justification for their policy. This is what makes Brett Kavanaugh a rallying point and unifying force among all types of conservatives. We have a #MeToo movement that Democrats have politicized against a decent human being who spends his spare time in soup kitchens serving meals. But Brett Kavanaugh did not cower. Now that the vote has been taken, the #CounterResistance will not soon forget how Brett Kavanaugh, a good man, was treated, and Red State Democrats may not be happy with the results at the ballot box in November. Evan Berryhill is a former communications staffer for Rep. David B. McKinley. Currently, Evan is a law student at West Virginia University. He has written for The Federalist, The Daily Caller, The Hill, Washington Examiner, and American Thinker among other publications. You can follow him on Twitter @EvBerryhill.